Registration includes coffee/tea at breaks, an awesome ICO 2019 canvas tote bag full of goodies, and admission to a Sunday evening mixer with alcohol and tapas. To make the meeting more affordable, we’ve made the Friday dragonfly tour (in place of the mid-Congress tour) optional as an add-on. You can add this tour and several other options below. To complete your order, click on the shopping cart icon (top right) or click here, then click “CHECKOUT” to pay. This is the typical registration option for most Congress attendees. This option is reserved for students (undergraduate, graduate, etc.) as well as postdocs and includes a significant price break to encourage them to attend the Congress. Register now! Earlybird rates end 30 April 2019! Below are a number of add-on items. Feel free to add as many as you’d like, or add them ALL! This year’s Congress dinner is going to be super cool! It’ll be held on Wednesday evening on a boat on Lady Bird Lake in Austin (walking distance from the Palmer Events Center). From the boat, we’ll get to see the emergence of Mexican free-tailed bats from their harborage under the Congress Street Bridge, the largest metropolitan bat colony in the world. Price will include Tex-Mex dinner and drinks available in the air conditioned cabin of the boat or you can take your dinner to the top of the boat and enjoy the view and atmosphere of Austin. On Friday, we’ll travel to some great dragonfly hotspots in the Austin area, which is home to 116 dragonfly and damselfly species! The tour includes travel by bus, lunch (included in price) will be catered by Austin Java, a locally owned restaurant that gets its ingredients locally. This event takes the place of the traditional mid-Congress tour. It’s optional, but highly encouraged! UPDATE: The Friday tour will include a dragonfly photography workshop! To attend, register for the Friday tour and sign up for the workshop at the meeting. The post congress tour will be from July 20th to July 24th in the Rio Grand Valley. The Rio Grand Valley is on the Texas-Mexico boarder and is a great place to see all sorts of unique dragonflies. We will charter a bus to our hotel, the Alamo Inn, in Alamo, Texas. From there we will hit locations like Santa Anna National Wildlife Refuge and Benson Rio Grand State Park. All the locations that we will stop are hot spots for birding, butterflies and of course dragonflies. If you love dragonflies and amazing Tex-Mex food this is an ideal trip! For more information on the post trip click here. NOTE: Because spots are limited, only folks registered for ICO will be allowed to register for the Post-Congress tour. Thanks for understanding! Admission to the mixer on Sunday is included with regular and student registration; however, if you would like to bring an accompanying person to the mixer, please purchase a ticket for them here. The ticket includes alcohol and tapas at the mixer. Below are two optional excursions that have been organized for accompanying persons. You can select one or add them both to your cart to maximize your Austin fun! Let’s head for the hills! This road trip takes you out of Austin and into our beloved Hill Country. Before we start tasting delicious foods, we begin this adventure with a serene visit to Lady Bird Johnson Wildflower Center. Take in the beauty and inspiration that comes from not only the gorgeous landscape but Lady Bird’s history herself! We’ll then wind through the hills and arrive at the most famous BBQ pit in Central Texas – The Salt Lick. You’ll experience why 2,000 people a day flock here to indulge on famous brisket and out of this world sides. This is the quintessential Hill Country tour! This Congress’s T-shirt was designed by Will Kuhn and features an American Rubyspot (Hetaerina americana) male. 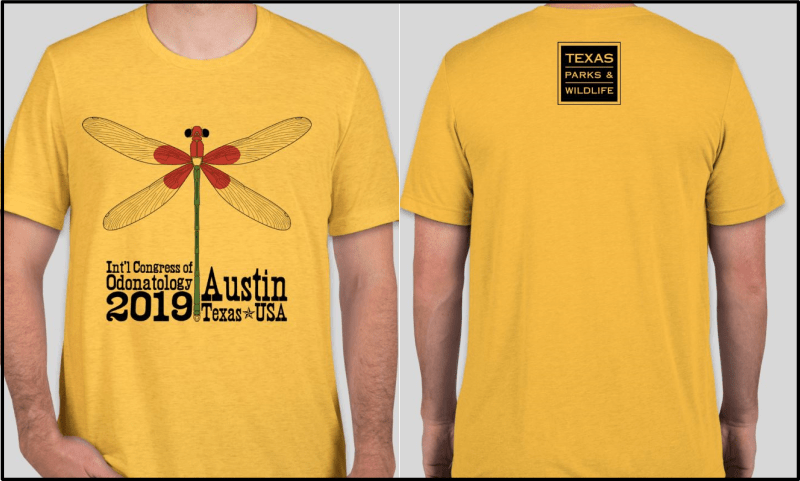 It’s printed on a yellow gold shirt, a sunny color to match the vibrance of Austin! The shirts will be printed by Nothing Too Fancy in Knoxville, TN on super-soft triblend material (cotton+polyester+rayon, sizing information here, measurements in inches). To complete your order, click on the shopping cart icon (top right) or click here, then click “CHECKOUT” to pay.